Earlier, we introduced you to the best online courses that can become a good starting point for those of you who dream of pursuing a career in blockchain. Today, we want to motivate you even more. It’s time to lay the cards on the table and reveal those attractive salaries, observe general positions, and find out if there are some special competencies that you might take on. According to CNBC statistics, the work of an average blockchain developer is rated higher than the regular software engineer: $150–175K vs $135K annually. The demand for blockchain engineers is also skyrocketing and has increased by 400 percent since late 2017. Together with AI developers, they are the highest paid software engineers in the US. The most unbeatable salary, discovered by Devsalary, was offered for an Ethereum Blockchain Engineering position rising up to an impressive $240–280K per year. Now that’s what we call motivation! Special competencies for engineering positions include blockchain quality engineers, smart contract writers, as well as developers for particular platforms such as Ethereum, Ripple, etc. San Francisco, Seattle, and New York offer the highest income for specialists in the industry. Top employers include ConsenSys, IBM, Coinbase, Figure, and Oracle. But there’s also a high demand for blockchain pros that come from startups and governments. Full stack developers are among the most desired. More than a fourth of employers encourage remote work. Apart from the difficulty of finding a highly skilled professional, the demand for blockchain developers is usually higher in the cities with a high cost of living, which also explains these howling salary numbers. Although developers are clearly reigning supreme, you still have a chance to get into the industry, even if you don’t want to go into the field of programming. However, you still have to be a techie at heart. Product Managers are the next best thing with an average salary that can go up to $130K. Their role, obviously, assumes a deep understanding of the product and the ability to be a link between two worlds — developers and regular human beings. They also need to lead the design and development of blockchain products and use blockchain technology to provide solutions for different business cases. Designers, who embraced blockchain, need to make sure that user interface and design of the product won’t confuse a regular consumer and make the experience as smooth as possible. Attorneys specializing in blockchain and finance are as good as gold. Every other week a new country comes up with new ideas for regulation regarding crypto and companies are overwhelmed with all the factors they have to consider. Cryptocurrency exchanges and payment providers should have up-to-date KYC and AML policies ready if they don’t want to end up serving jail time. It is quite hard to find a competent attorney that deals with crypto and those who do are generously reimbursed. Apart from the professions we’ve already mentioned, there is a growing demand for marketing specialists, freelance journalists, community managers, risk analysts, consultants, and PR gurus. Non-conventional professions include bloggers who review ICOs, bounty campaign managers, and even meme creators (yes, that’s a thing!). In its very core, the blockchain industry, like any other industry, first and foremost values two things: knowledge and diversity. So if you’re good at something and, on top of that, you’re really curious about the blockchain, go on and educate yourself on the techie part, combine your skills, and create your future job for yourself. The industry is still young and open-minded, it welcomes the initiative and amply rewards the hard work. And if you don’t know where to start, try volunteering. Research the area, find a project that inspires you, and get in touch with the team. Do you have your own story about building a blockchain career? 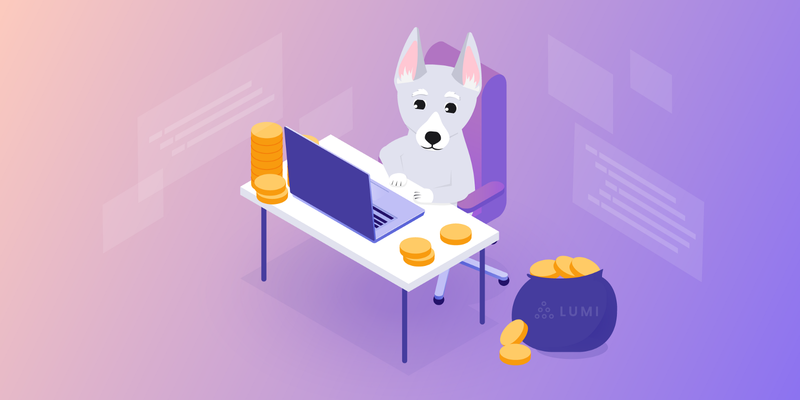 Lumi Wallets wants to know all about it! Join our Telegram and speak up. Follow us on Twitter, Facebook, or Reddit so you won’t miss our next article.